Survey for Sellers | Christian & Co.
A marine survey performed at the time a vessel is listed for sale allows the broker and seller the opportunity to address deficiencies in advance of the sale’s process, facilitating a smooth sales process. It also provides a realistic appraisal and it enhances the listing. A seller’s survey, though non-traditional, has been used as an effective sales tool by many experienced sellers and brokers for some time. Identifying deficiencies in a vessel, which will inevitably lead to further negotiations, increases the closing percentage. Every deficiency which requires negotiation is another opportunity for the buyer or seller to alter the course of the sale. Negotiating repairs or contingency fees delays the sale process. Addressing deficiencies prior to the sales contract provides for a more fluid and hassle free sales process. A recent survey commissioned by the seller found a loose steering stop. The problem was potentially serious, as a slight progression could have resulted in steering failure. Fortunately, the problem was easily addressed. This allowed the seller to choose the repairer and repair method with no pressure, effect the repair and eliminate this problem prior to the sales process. This is the type of problem, even when skillfully explained, that can create questions in the buyer’s mind. This boat is being sold and there will be no issue with the steering system during the buyer’s survey. A seller’s survey does not necessarily preclude a buyer’s survey. A unique option we are promoting is a “split survey”. If the buyer and seller agree to share their surveys, a positive result is obtained from the purchase process, whether or not that sale is consummated. If the buyer does not proceed with the purchase, they have saved money on the survey process and the seller/owner has a full and complete survey, also at a significant savings. If the sale is consummated, the buyer has saved money on the survey cost and the seller has obtained their ultimate goal. We offer a seller’s survey at a discount from our standard buyer’s survey price. The seller’s survey is performed in the slip, the machine systems are not tested during a sea trial, the vessel is not hauled but most deficiencies can still be reported and addressed prior to a sales contract being signed. The seller’s survey can be coupled with a sea trial and bottom inspection, funded by the buyer, and these surveys together should meet all the requirements for finance and insurance and provide the buyer and seller with a thorough condition and valuation report, inclusive of a bottom inspection and sea trial. Some lenders and insurance carriers are requesting the surveyor comment on the function of the engines, the sea trial takes care of this issue. In the unsteady economic times we have noticed a sharp decline in boat values. An independent appraisal of the value is advantageous to the seller and the broker. The seller can rest assured that the surveyor has no financial interest in the evaluation and the independent appraisal can assist the broker in their dealings with the seller and with potential buyers. The existence of a recent marine survey, particularly if done by a marine surveying company known for professionalism, integrity and thoroughness, enhances a listing. It provides more information for potential buyers to consider, thus capturing their attention and increasing the chances of their making an offer. It provides additional information for brokers browsing listings and is an invaluable tool in the listing process. The existence of a recent survey provides an advantage to the seller in a tough market where any advantage is important. In the example of the steering system repair, the survey finding was addressed and the combination of the survey, recommendation compliance comment and physical repair, gives the potential buyer an indication of “pride of ownership”. Any vessel listed for sale or potentially for sale should have the bottom inspected during each haul out. This provides a future potential buyer with documentation of the condition of the vessel and may save the expense of a second haul for survey. It provides the seller with the documentation of the condition of the bottom, which is often useful when seeking insurance or financing, which are occasionally unexpected needs. 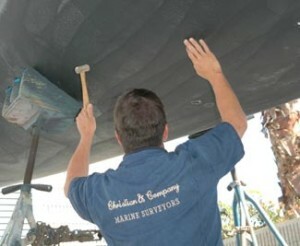 Christian & Company Marine Surveyors is ideally suited to perform seller’s surveys. We excel in customer service and welcome enquiries from potential buyers. We communicate effectively to reduce fear and confusion while accurately portraying the condition of the vessel. Our friendly office staff facilitates the transmission of surveys, communication between clients and our three surveyors and maintains customer service at the highest level in our industry.